If you are a chocoholic, then do yourself a favor, buy this book and let the bliss begin. This book is the most lavish and the most complete, ever published on the subject of that most sensuous of all foods—chocolate. Filled with 371 of the world's best recipes, This book is literally a chocolate lover’s dream come true. 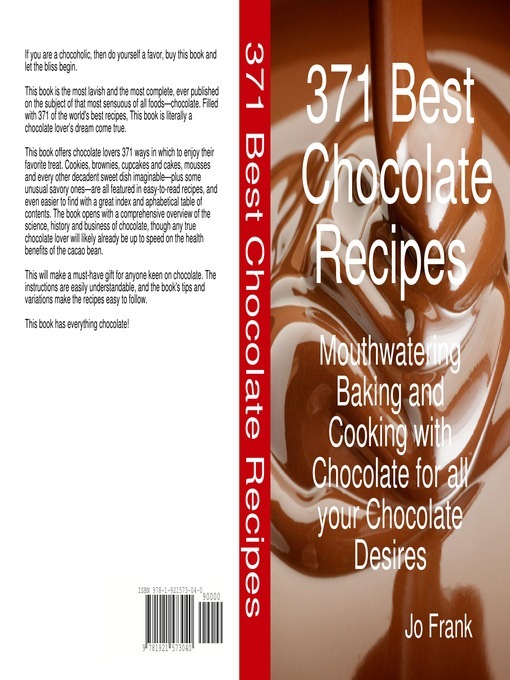 This book offers chocolate lovers 371 ways in which to enjoy their favorite treat. Cookies, brownies, cupcakes and cakes, mousses and every other decadent sweet dish imaginable—plus some unusual savory ones—are all featured in easy-to-read recipes, and even easier to find with a great index and aphabetical table of contents. The book opens with a comprehensive overview of the science, history and business of chocolate, though any true chocolate lover will likely already be up to speed on the health benefits of the cacao bean. This will make a must-have gift for anyone keen on chocolate. The instructions are easily understandable, and the book's tips and variations make the recipes easy to follow. This book has everything chocolate!